With regards to Ping, out of the box a Cisco firewall will allow you to ping the interface you are connected to, so in a normal setup inside clients can ping the inside interface, and the firewalls outside interface can be pinged from outside. OK – to understand pinging through a Cisco Firewall you need to understand that Ping is part of the ICMP protocol suite, and unlike other protocols is not “connection orientated” what that means is, (on a new firewall that has no rules applied outbound) the firewall happily lets ping traffic out but it won’t let ping traffic back in – this results in a failure on the client. Version 7 introduced an ICMP inspection engine so that it could track ICMP requests like other protocols. It’s NOT turned on by default. And the command is “inspect icmp” but you need to enter the default map first (this assumes you have the standard policy-map). Connect to the firewall and use the following commands from config terminal mode. then save the changes with a “write mem” command. Connect to the ASDM > Configuration > Firewall > Service Policy Rules > Select “inspection_default” > Edit > Rule Actions > Tick ICMP > OK > Apply > File > Save running configuration to flash. access-group inbound in interface outside <<This ones called inbound. If you already have an access-list applied then simply substitute the name word “inbound” for the name on your ACL. If you HAD an inbound ACL skip this step, If you didn’t have one you need to apply the ACL with an access-group command. Lastly save your work with a write mem command. 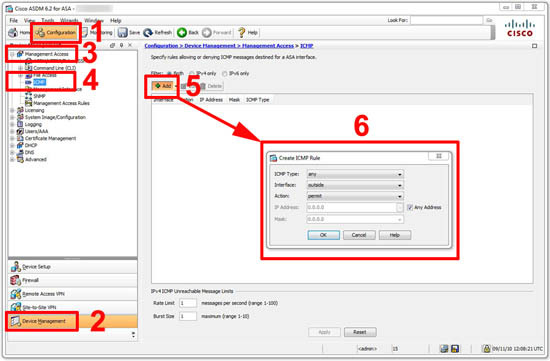 Connect to the PDM > Configuration > Access Rules > Rules > Add > Permit > Outside Inside > Tick ICMP > Select “echo-reply”> OK > Apply > File > Save running configuration to flash. As stated above all firewall interfaces will respond to pings if they are on the network you are connected to. To stop this you use the “icmp” command. 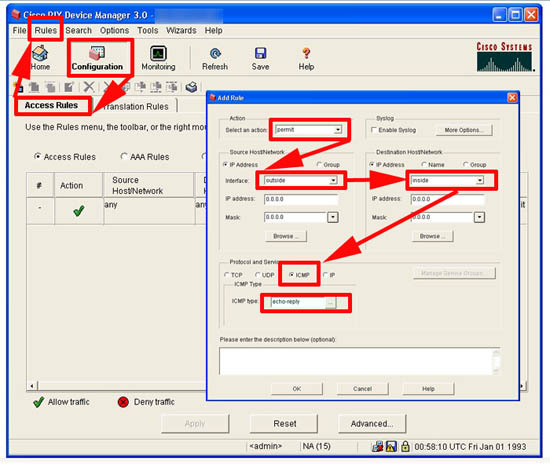 Connect to the ASDM > Configuration > Device Management > Management Access > ICMP > Add > Select ICMP type > Interface > Action > OK > Apply > File > Save running configuration to flash. 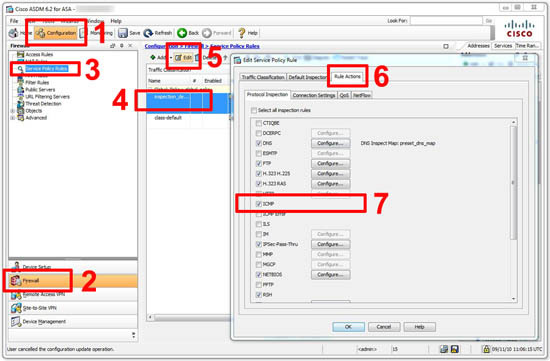 Connect to the PDM > Configuration > system Properties > Administration > ICMP > Add > > Specify the Type, Interface, Source etc > OK > Apply > File > Save running configuration to flash.